Famed for its warm welcome, attentive service and the quality of its equipment and facilities, Le Francis is a 4-star hotel, the Bayou Restaurant and Pub and conference rooms… all under the same roof. 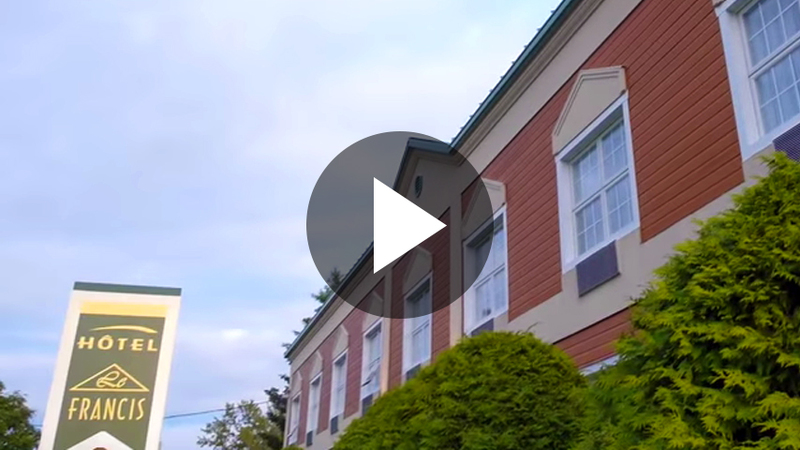 Located in New Richmond, on the bank of the magnificent Petite Cascapédia salmon river, the 38-room hotel has a heated outdoor pool and spa, hiking trails and a 40-metre bridge over the river as well as kayaks and bicycles for its clients. With one of the most impressive wine cellars on the Gaspé Peninsula, its pub/terrace and restaurant, each with its own distinct atmosphere and which together can seat up to 120 people, offer the same delicious evolving menu featuring local fare. Finally, the establishment also has two picture-windowed conference rooms that can be combined, with seating for up to 120 people. Some thirty people make up the establishment’s team, under the leadership of the following individuals. The team can be reached by e-mail at contact@hotelfrancis.qc.ca. Offer our clients superior-quality accommodation, dining and business-meeting experiences by providing attentive service, superior comfort, inviting décor and a delicious menu with a local flavour. Maintain 4-star quality standards by banking on the ongoing improvement of our facilities, gourmet experience and service, thanks to a professional, united and mobilised team, and remain an establishment recognised for its eco-responsible practices. Hôtel Le Francis and Bayou Restaurant and Pub are pleased to be involved in the community by supporting certain cultural and sports events, and by sponsoring sports teams and social clubs.